Bob Kravitz (left) with Mike Wells, who will start his new gig with ESPN one week from tomorrow. Former Indiana Pacers beat reporter and briefly the new lead Colts guy Mike Wells, will begin work covering the Colts for ESPN on August 5th. 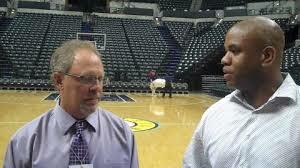 Terry Hutchens is gone as the Indiana University beat reporter, and Wells former spot on the Pacers beat is being manned by Michael Pointer on an interim basis. That’s a total of three holes in major beats, and sports director Ronnie Ramos is in a position to make some interesting choices in deciding who gets to man those positions. The excellent Zak Keefer has filled David Woods spot covering Butler, and he must be getting close with IU and the Pacers as the positions have been open for a month. Ramos has a lot of work to do to fill the three most important beats at the paper, but with columnist Bob Kravitz, Phillip B. Wilson, Curt Cavin, Phil Richards, Mike Chappell, and the rest of the staff still churning content and not much going on right now, he has time to be able to find the people he feels will be the right fit for three major jobs. This gives Ramos the opportunity to put his mark on the sports product. I’m sure he wasn’t hired to maintain the status quo or Hutchens wouldn’t have been moved out, and Wells would have continued covering the Pacers. The toughest part of the sports editor/director job today is in trying to hold onto solid reporters and columnists as the online efforts of ESPN, Fox, Yahoo, and a dozen other online only content providers scour the withering staffs of daily newspapers for multimedia pros with access to unique information and athletes. That’s what happened to the Star when Wells announced his move to ESPN. Wells is a pro, who not only did a great job covering the Pacers for the Star, but has shown himself to be a very adept guest and co-host on local radio shows. He’s knowledgeable, diligent, and most importantly interesting with a solid sense of humor. Without a doubt, the most fun responsibility for a person in Ramos’ position is hiring people. There are so many meetings to discuss cuts in media today, and so many plans to execute to manage expenses that the time spent evaluating and deciding who to hire is the highlight of the year. My hope is that the Star begins to increase the level of perspective, rather than simply a source for information readily available elsewhere. Over the last 15 years, according to some research made available to me last week, the percentage of media consumers who rely upon newspapers as their first source of information has plummeted from 64% to 16%. While online offerings from newspaper sports departments are part of the reason that the internet has skyrocketed as a source, finding unique opinions is a driver of audience. Minus Kravitz, the Star isn’t staffed to tell fans why or how – just who and what. One person who is definitely worth reading when he writes is assistant sports editor Mark Alesia, who is an exceptionally knowledgeable source regarding the complicated evolution of the NCAA. He has a great faculty for communicating simply and infusing his work with the perspective needed to understand the direction of collegiate athletics. There are people at the Star plenty capable of doing more, but until they are pushed to publish their insight, the Star’s management will continue to talk about cuts in internal meetings instead of product development and audience growth. For the next few weeks, Ramos will be ale to have some fun, make some hires, and put his mark on the department he runs. I hope he gets the right people, turns them loose, and finds a way to get the resources he needs to hold on to them – so the next Mike Wells doesn’t jump to greener and more stable pastures. This entry was posted in Featured Story, Kent Sterling, Media and tagged Bob Kravitz, Curt Cavin, Jim Lefko, Michael Pointer, Mike Chappell, Phil Richards, Phillip B. Wilson, Ronnie Ramos, Zak Keefer on July 28, 2013 by Kent Sterling. You are nice to say so. Meant to say hey yesterday, and grab you for a segment, but Hagan waved Doug Boles right at the end of the show. Someone needs to put you back on the radio to do what you are best at. You are the best story teller I know. Phil RIchards is the best writer on the staff of the Indianapolis Star. PERIOD.